The Indigenous People of Biafra (IPOB) has maintained that Nigerian government cannot stop the Sit-at-Home order it gave to Biafrans for May 30 this year, in honour of Biafran fallen heroes. This year’s celebration is special because it marks 50 years since the declaration of the Republic of Biafra in 1967. IPOB has therefore, appealed to its people within the South-eastern part of Biafraland, and those at the Riverine parts to obey the order. Ever since that order went out, the people have been in high spirits, organizing campaigns and sensitization marches all over Biafraland. Biafra Choice Writers investigation across Biafraland shows that all the peoples are showing outstanding inclination towards obeying the order given directly by Nnamdi Kanu, leader of IPOB. From Nnewi to Abakaliki; Igbanke to Calabar; even from Markurdi to Port Harcourt, the people are rising in anticipation. The day “Biafra Fallen Heroes Day” has always been celebrated by IPOB in all the parts of the world were Biafrans are found. The celebration is in respect to Biafrans killed by the murderous Fulani bloodsuckers and their Hausa slaves in their many orgies of violence against Biafrans. It is also celebrated to respect Biafrans who died in the 1967-70 Biafra/Nigeria war – both in the battle-fields and in their homes. It is usually a celebrated in respect to the combatants and the innocent civilians, women and children murdered in their residential areas, churches markets, and train and vehicle stations. Before now, the celebration were celebrated everywhere (including Biafraland) with marches, with singing and dancing in the usually exciting Biafran colours. But the Nigerian Army, Navy and Police have always used the opportunity to murder the innocent and defenseless Biafrans. This is why the celebration in Biafraland will be done indoors by the people, with prayer and supplication to God. In spite of this, IPOB is aware that the saboteurs within and outside Biafraland, even those claiming to be supporting IPOB and Nnamdi Kanu, are seriously working underground with the government of Nigeria, in collaboration with Britain to truncate the celebrations. So, it becomes important that Biafrans in Biafraland must stay at home that day. Let us see how the evil Nigerian forces will go into people’s houses to force them into the street. 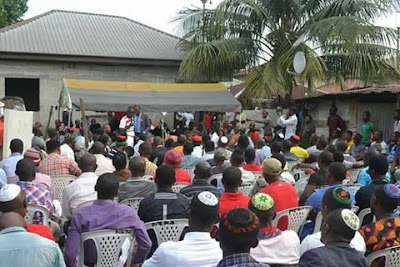 In addition, IPOB is using this year’s remembrance day Sit-at-Home exercise to prove to the entire world that Biafrans are ready for: 1, to use this particular sit at home to test-run their coming boycott of all Nigeria’s elections in Biafraland; and 2, to use it a test-referendum of how much Biafrans are eager to exit from the evil contraption called Nigeria. Therefor all markets, banks, schools, transport companies, artisans, national Union of road transport workers (NURTW) and driver's welfare in Biafraland, must shut down on that particular day to honour our fallen heroes and heroines.